Yes, what a mix in this post! You can read about books, sunburn and read a newsarticle! A very strange combination! 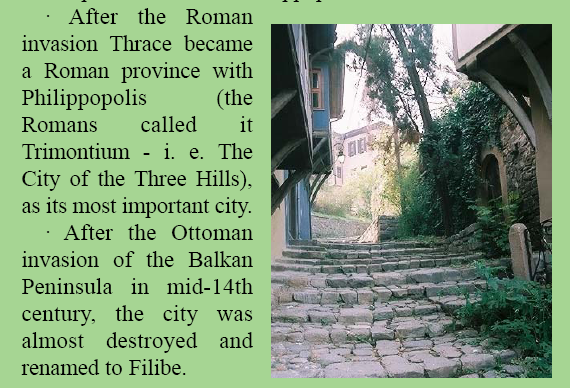 Review 1: Amazon.co.uk ….Margolan, so prosperous and peaceful under King Bricen’s rule, has been reduced to starvation in less than a year. Everyone knows of the usurpation of the crown of Margolan by “Jared the Tyrant”. He and his fire mage, Foor Arontala, have also broken the truce with the Blood Council and are hunting down all vayash moru (vampires). Things are going from bad to worse as the night of the Hawthorn Moon approaches. On that night, half a year from now, Jared and Arontala plan to feed all the souls captured in the Soulcatcher orb to the Obsidian King. Once accomplished, the Obsidian King will have the power needed to break free of the prison, which the Summoner named Bava K’aa had thrown him into, and evil will claim the entire Winter Kingdom. He is Prince Martris “Tris” Drayke, son of Bricen of Margolan, Summoner and mage-heir of Bava K’aa. However, anyone looking at him would never imagine that he was more than a simple peasant enduring hard times, just like everyone else. The Sisterhood grudgingly agree to train Tris for his upcoming battles, but there is no guarantee that he will survive the training. Arontala is not only a strong fire mage, but is using blood magic (via sacrifices) to increase his power. Arontala will also draw power from the Obsidian King once he is freed. Tris may very well be the strongest Summoner since Bava K’aa, but it is still going to be a royal battle indeed. 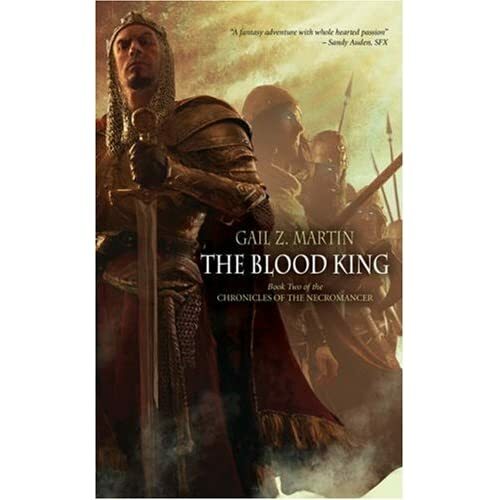 Review 2: Amazon…———–This story lacks the vigour, pace and imagination of the first book in the series. It feels as though the story has been padded out to achieve a deadline and had less enthusiasm from the author than the first book. I have around 3 chapters to go to finish it and I will do so, however, it is proving necessary to force myself to complete the book. Perhaps the finale will change my view, if it does I’ll come back and amend this. That all aside, it is readable if you have read the first one but I would have preferred to buy this second hand! Review: Amazon.co.uk …This book was a fabulous read! It’s entertaining but also informative. It’s a great balance between fun & useful, and isn’t dumbed down to cater to the uninitiated – it’s just explained better than the average scientific text. It’s funny, insightful and fascinating! 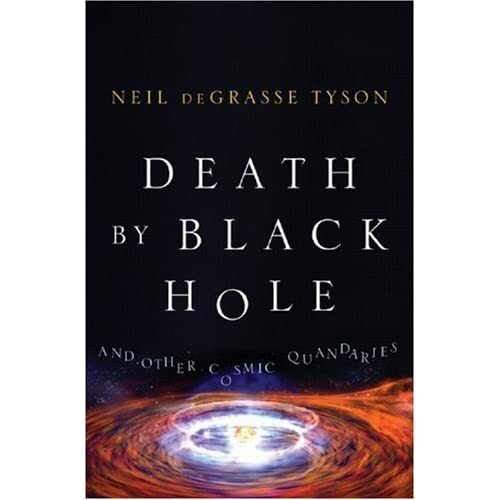 Highly recommended for anyone with the slightest interest in discovering our universe. Review: Amazon.co.uk…..If you’re looking for a PS I Love You part two, then you will be sadly disappointed. Instead you step in to the world of Rosie Dunne and her best friend Alex Stewart. Rosie is an ordinary woman trying to get on with her day to day life who quite simply misses her best friend. 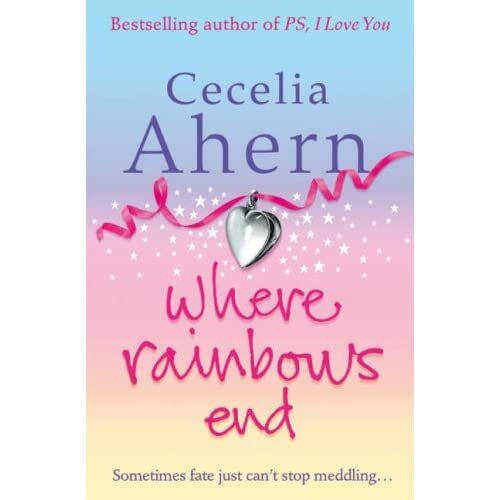 What starts out as an innocent childhood friendship turns to love, yet neither of them realise it. This is a beautifully written tale of two people who share a deep rooted friendship who are seperated at a young age. It is a cleverly written story told in the form of emails, instant messages, letters and text messages which span 45 years. It contains a variety of emotions, one minute you are laughing and the next you are wiping away the tears, but throughout the book you carry the hope that this time they really will get it together. Quite simply, you’d be really stupid to pass up the chance to read this novel. We all know this! We all know why Mugabe didn’t want to make the results public… we are not stupid! Who does he think he is! Why couldn’t Zuma nor Mbeki tell it in his face to him… is it a matter of…”birds of a feather…flock together…” ?.. Read the news article HERE on the site of the BBC. ….WHAT??? do I need glasses for reading this…. Meanwhile, the leader of the governing ANC in South Africa, Jacob Zuma, is refusing to blame Mr Mugabe for the violence. On THIS LINK you can see a video of the torturing going on, slide down on the page to watch the video. 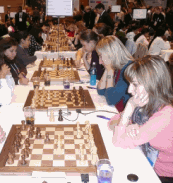 Round 7…results…please click HERE to play through the games in round 7…in the women’s section and click HERE to play through the games of the men. 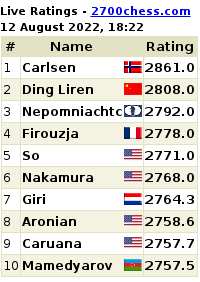 Round 5 results…Please click HERE to play through the games interactively. 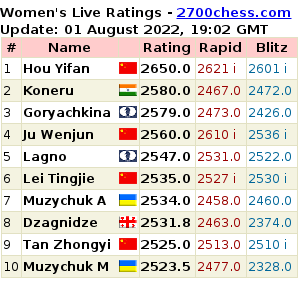 The European Individual Chess Championship is now taking place in Bulgaria…men/women are battling for the top positions. On THIS LINK you can view their games live. Round 4 will be played today. Please click HERE for results and standings where you can view more photos of the participants too. I usually don’t like to talk politics…but feel I must voice my disgust and contempt for our President, Thabo Mbeki for what he says…. I see him as a coward… he can’t speak up…. he won’t!! We all know why he’s reacting like this…he wants to do exactly the same in SA..(already busy!) and it’s easier if he’s got Zimbabwe’s support……if you don’t know what’s going on in SA… then…read at least THIS BLOG , but be aware, you won’t like what you read/see…but it’s the truth…don’t read this blog if you are under the age of 13. Update: Sept 22…read this link…and read all of the comments too….and enjoy! 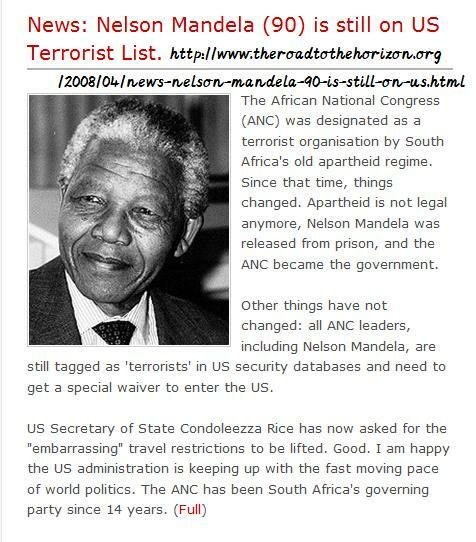 I also think you would find THIS LINK interesting…where the USA still have Mandela on the list as a terrorist! See a link on the side bar of my blog too. Click on the image for a clearer view.  Image from the link above. But…not only is Mbeki a coward…but read my message at the bottom of this post…more “leaders” in this world ….. Critics say seizures of white-owned farms that began in 2000 triggered a fall in food production and the collapse of Zimbabwe’s economy. Armed police in Zimbabwe have prevented lawyers from the opposition MDC from entering a court to file a petition on the country’s presidential elections. The MDC wants the High Court to force electoral officials to release the result of the poll, held a week ago. The party believes its leader Morgan Tsvangirai won the ballot. His opponent President Robert Mugabe’s Zanu-PF party has said it will back him if a run-off is called. MDC (Movement for Democratic Change) spokesman Alec Muchadehama told AFP news agency the party was doing “everything in our powers” to have its petition heard on Saturday at Harare High Court. The MDC has also called for international help to prevent possible violence if a second round is held. But speaking in the UK, South African President Thabo Mbeki said that now was not the time to interfere, and the international community should wait to find out the outcome of the election. Read this next article HERE on the BBC’s website and there are more links to follow….this was written in Sept 2007…so, why has nothing been done by the international community to stop this crazy man! 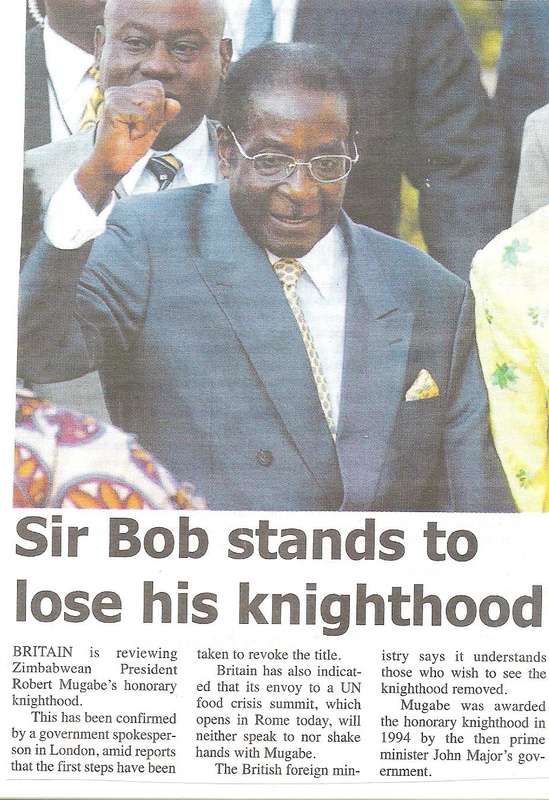 The Archbishop of York, Dr. John Sentamu has called Zimbabwe’s president Robert Mugabe ‘the worst kind of racist dictator’, and likened him to the Ugandan dictator Idi Amin. He said Britain’s prime minister Gordon Brown should lead a coalition of countries in mounting stricter international sanctions against Zimbabwe and said the time for ‘African solutions’ is over. And …the next article can be read in fully HERE …from a journalist in South Africa… worth reading! This made me angry. As it turned out, the Sunday Times changed the tone and meaning of Mbeki’s words by selective quotation. For example, it used an innoccuous ellipsis to omit a crucial caveat: “but by no means everybody who is white”. So contrary to the impression left by the report, Mbeki wasn’t calling everyone who complained about crime a racist. Worth reading The ogre of Harare here on this link. 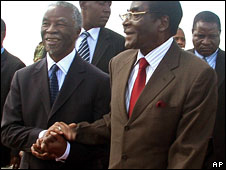 This is a brilliant image of Thabo Mbeki …supporting Mugabe! On THIS LINK here, you can read…unfortunately in Afrikaans only … how farmers in Zimbabwe were forced to leave their farms…despite what’s going on in the country!!! THREE news articles…but only in Afrikaans..about this outrageous situation! More than 60 mostly white Zimbabwean farmers have been evicted from their land by war veterans loyal to President Robert Mugabe since the weekend, a farmers’ union said on Tuesday. “The situation is very severe. The evictions are continuing right round the country. “We have over 60 farmers evicted as of this morning. “Every couple of minutes my phone is ringing with another case of eviction,” Commercial Farmers’ Union President Trevor Gifford told Reuters. The veterans have been used as political shock troops by President Robert Mugabe. Read the entire article on the link! 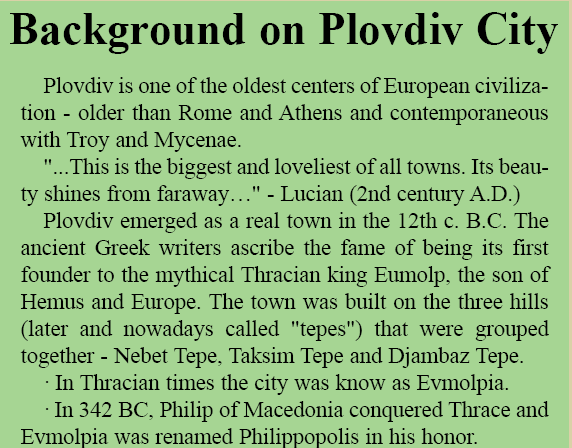 Click HERE to read about what you see on this image! WHY IS THE WORLD STILL WAITING!!! I want to call the leaders of this world..COWARDS!!! Come on England…YOU are the one to do something…YOU placed Mugabe there!!! in 1980!! By Phakamisa Ndzamela Reuters – JOHANNESBURG (Reuters) – South Africa’s President Thabo Mbeki has agreed to step down after the ruling African National Congress asked him to resign, his office said on Saturday. The ANC’s decision to remove Mbeki, who was favoured by investors for his pro-business policies, could raise political instability in Africa’s economic powerhouse 14 years after its transition from the end of white minority rule. But a smooth process to replace him may calm investor fears. “Following the decision of the National Executive Committee of the African National Congress to recall President Thabo Mbeki, the President has obliged and will step down after all constitutional requirements have been met,” the presidency said in a statement. The ANC’s National Executive Committee, its top decision-making body, earlier decided to recall the president following years of infighting since his decision to fire his then deputy Jacob Zuma in 2005. “After a long and difficult discussion the ANC decided to recall the President before his term of office expires,” ANC secretary-general Gwede Mantashe told a news conference. The decision must now be ratified by parliament, which should be a formality, given the ANC’s two-thirds majority. 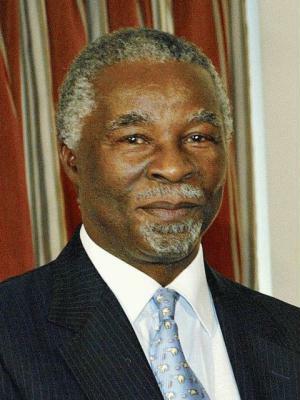 Mbeki, who has ruled South Africa since taking over from Nelson Mandela in 1999, was due to leave office in 2009. He lost the leadership of the ANC to Zuma last year. Zuma, who is popular with leftists within the party and with its trade union and communist party allies, is the frontrunner to succeed Mbeki. It was unclear whether he would immediately step into the breach left by Mbeki. He would first have to be appointed to parliament and the cabinet. Deputy President Phumzile Mlambo-Ngcuka could assume the presidency but she has signalled she will resign with Mbeki. Cabinet ministers and the speaker of parliament follow in the succession line. It is generally expected that parliament, which is dominated by the ANC, will elect a new president within 30 days. Baleka Mbete, the speaker of parliament and a Zuma loyalist, has been mentioned as the most likely one to lead the transition. Mantashe said the ANC would ask Mbeki’s cabinet ministers, including Finance Minister Trevor Manuel — who is widely respected by markets — to remain in their positions in the transition period for the sake of stability. Manuel’s office told Reuters he would not step down — a decision that should calm some investors fears. “If you have the continuity of the cabinet staying largely intact I would not expect a major market reaction,” Citigroup strategist Leon Myburgh said. “But you will have to see how individuals react…key decision-makers like Finance Minister Trevor Manuel will be key to how the market reacts. Mbeki and Manuel have presided over the country’s longest ever period of economic growth — a decade. Mbeki’s presidency ended after a heated debate within the ANC executive committee over his future in the wake of allegations he had meddled in a corruption case against Zuma. Trade unions and ANC members have accused Mbeki and his aides of plotting to smear Zuma and derail his hopes of succeeding Mbeki. The South African leader has consistently denied any involvement in the prosecution. Last week a judge dismissed the charges against Zuma, which were linked to an arms deal, and suggested that there had been high-level political involvement in the case. The ruling spurred Zuma militants within the executive to demand Mbeki’s head. 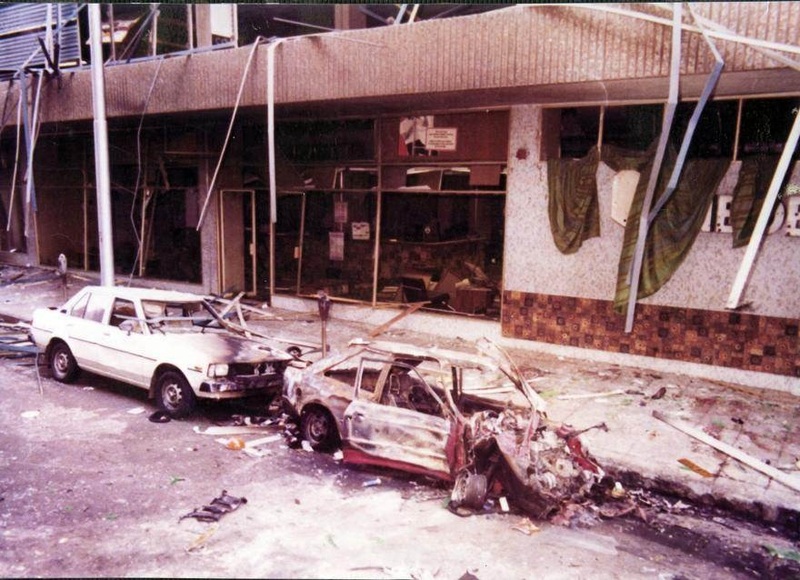 And on this link HERE you can read about the 1983 car bomb in Church Street, Pretoria, where the ANC killed 17 people and more than 100 were injured. People like you and me… minding their own business on a normal day. 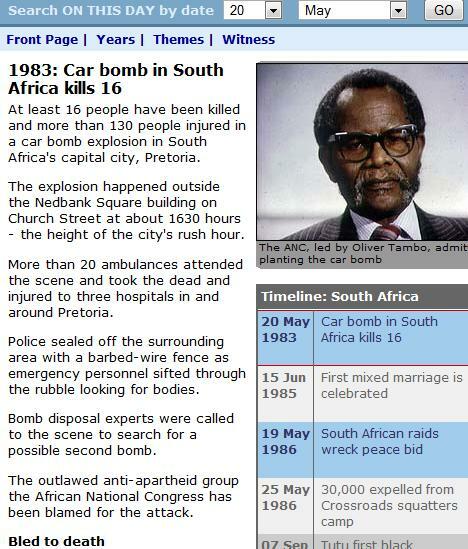 Oliver Tambo admitted planting the bomb. Kerkstraat bom 1983 Images: Whisnews bottom pic: people shocked by what was happening. This is what Mandela organised. Image: Die Burger – 30 years on, after the bomb in Pretoria by Mandela where 16 innocent people were killed. It makes me sick to think people think Mandela is a hero! 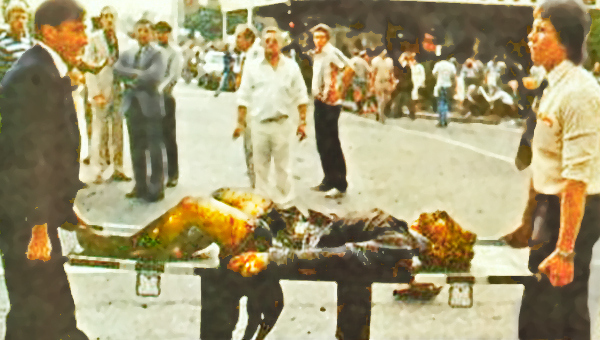 Update: 2012 – Read on the above link more about the 1983 bomb. Also images available on this link. Die voertuig waarin die bom ontplof het, se bakwerk het geheel-en-al gedisintegreer. Die masjiennommer is afgeskuur. Deur middel van die onderstelnommer wat tussen die rommel gevind is, is die voertuig as ŉ roomkleurige 1982-model Colt Galant geïdentifiseer. 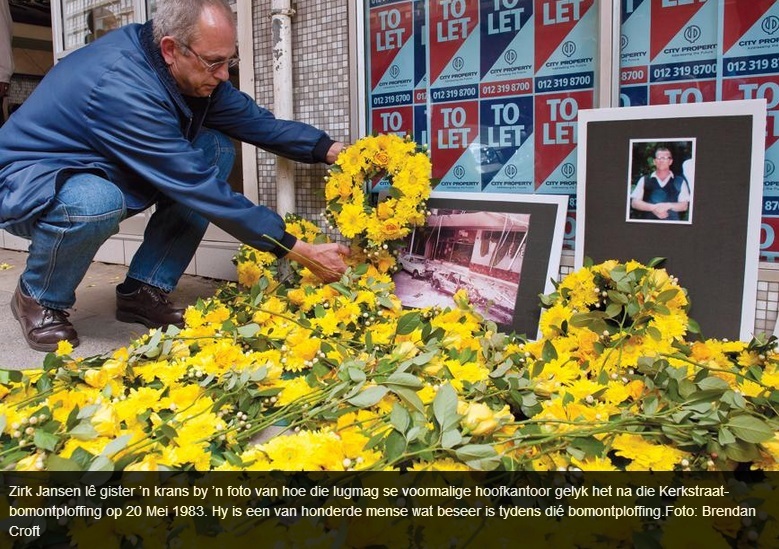 Dit is op 19 Junie 1982 vanaf die perseel van mnr. V.A. Sabattier te 6de Laan 5, Edenvale gesteel. Tussen die rommel is ook ŉ stuk van ŉ voertuigregistrasieplaat wat met ŉ “SD”-registrasienommer begin, gevind. · As gevolg van die ontploffing, is 19 persone gedood – 17 mans (8 swart, 9 wit) en 2 vrouens. Ernstige skade is aan geboue en voertuie in Kerkstraat-Wes tussen Bosman- en Schubartstraat aangerig. Die skade het ongeveer R4 000 000 in 1983-terme beloop. Getuienis is bekom dat ŉ roomkleurige Colt Galant met ŉ “SD”-registrasienommer op 20 Mei 1983 om ongeveer 11:00 deur ene Freddi Butana Shongwe van Blok B388, Mamelodi na die huis van Bakayi Ezekiel Maseko te Blok J 2824, Mamelodi gebring is. Shongwe het by ene Jerry Shabangu verneem of die oorsprong van die voertuig nog bepaal kan word indien die masjiennommer verwyder is. Hy het die roomkleurige Colt Galant aan Shabangu getoon waar dit agter Maseko se huis versteek was. Shongwe het aan Shabangu gemeld dat die voertuig vir ŉ “groot werk” gebruik gaan word, sonder om te sê wat die “werk” sou wees. Maseko se vrou Anna het gesien dat Maseko en Shongwe die masjiennommer met ŉ elektriese skuurmasjien afgeskuur het. Shongwe het om ongeveer 15:50 haastig met die Colt Galant vertrek terwyl Maseko hom in laasgenoemde se Kombi gevolg het. Hulle was so haastig dat hulle die elektriese skuurmasjien buite die huis gelaat het waar hulle daarmee gewerk het. Vanaf 20 Mei 1983 toe Shongwe en Maseko nie tuisgekom het nie, het hulle familie na hulle begin soek. Op 28 Mei 1983 is Maseko se Kombi agter die Poyntonsgebou in Schubartstraat, Pretoria gevind. Die voertuig was nie gesluit nie. Binne die voertuig is ŉ baadjie van Shongwe gevind wat hy op 20 Mei 1983 aangehad het. In die voertuig is ook ŉ papiersak met ŉ draagbare radio in, gevind. Nadat die voertuig met die inhoud verwyder is, het die familie begin vermoed dat Maseko en Shongwe onder die slagoffers van die ontploffing kon wees. Maseko se liggaam is daarop by die Staatslykhuis uitgeken. Maseko se liggaam is aan die noordelike kant van Kerkstraat regoor die ontploffing gevind. 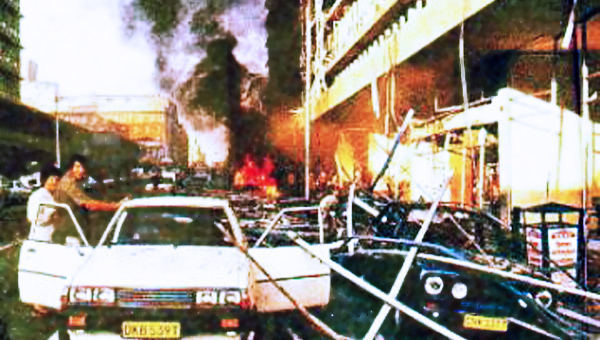 Na die ontploffing op 20 Mei 1983 is verskeie liggaamsdele gevind wat oor die toneel versprei was. Op 13 Junie 1983 is die voete van hierdie persoon deur sy moeder as dié van Freddie Shongwe uitgeken. Shongwe se vrou het ook ŉ stuk broek en lyfband wat op die toneel gevind is, as die eiendom van Shongwe herken. Uit die verspreiding en gedeeltes wat aan die voertuigwrak gevind is, is dit duidelik dat Shongwe tydens die ontploffing in die voertuig was. 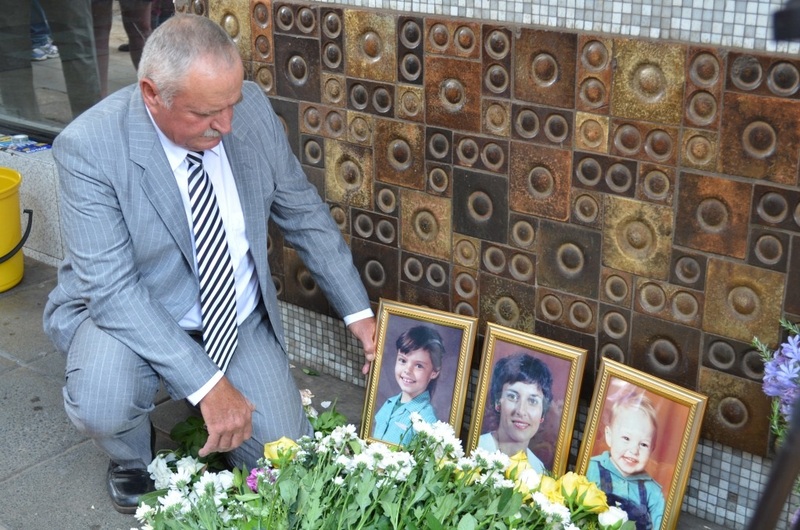 Volgens die verklaring van ŉ getuie wat op 20 Mei 1983 voor die Nedparkgebou in Kerkstraat-Wes, Pretoria in haar motor gesit het, het ŉ roomkleurige Colt Galant voor haar stilgehou. Pas nadat die voertuig tot stilstand gekom het, het die ontploffing gevolg. Op 7 Julie 1983 het Anna Maseko die elektriese skuurmasjien, asook die draagbare radio aan die ondersoekers oorhandig. By ondersoek is gevind dat die draagbare radio wat in Maseko se Kombi gevind is, van ŉ ingeboude afstandbeheerkontrole voorsien is. Hierdie afstandbeheerkontrole is deur deskundiges in werkende orde bevind. Dit was ook in staat om plofstof oor ŉ afstand te laat ontplof. Volgens deskundiges is die frekwensie waarop die afstandbeheerkontrole ingestel was, baie sensitief, en kon dit deur ander faktore wat binne die beheerafstand kom, geaktiveer word. In Maseko se klere by sy huis is kontant ten bedrae van R3 000 gevind, waarvoor Anna Maseko geen verklaring kon vind nie. Sy het van die geld vir die begrafniskoste gebruik. Shongwe en Maseko het vorige veroordelings weens “huisbraak en brandkasdiefstalle” gehad. Shongwe en Maseko het by meer as een geleentheid saam na Swaziland gegaan. Shongwe het Swaziland soms tot twee keer per maand besoek. Getuienis is gevind dat Shongwe aan huis van bekende lede van die African National Congress (ANC) in Swaziland gesien is. Shongwe is die neef van ŉ opgeleide ANC-lid, Johannes Mnisi. Volgens inligting het Shongwe en Maseko met bogenoemde in Swaziland skakeling gehad. Dit is ook vasgestel dat Shongwe Swaziland laas van 16 tot 17 Mei 1983 besoek het. Tydens die Waarheids- en Versoeningskommissie (WVK) se werksaamhede is amnestie vir die Kerkstraatbom toegestaan aan Aboobaker Ismail, destydse hoof van Umkhonto we Sizwe se eenheid vir spesiale operasies, en Johannes Mnisi. Ten spyte daarvan dat die ANC reeds in die verlede erken het dat die ANC se militêre vleuel, Umkhonto we Sizwe (MK), se optrede “ten alle tye aan die politieke leierskap van die ANC onderhewig was”, het geen lid van die ANC se NUK van daardie tyd om amnestie vir die Kerkstraatbom aansoek gedoen nie. REYKJAVIK (Reuters) – Boris Spassky, the Soviet chess champ who famously squared off against Bobby Fischer in Iceland at the height of the Cold War, visited his former rival’s grave on Tuesday at a small cemetery near the capital. Fischer, who died in January aged 64, bested Spassky in that headline-grabbing 1972 match to become the first, and still only, American world chess champion. A clearly moved Spassky bent and dusted snow off the grave and flowers before straightening up and wiping his eyes. Fischer beat Spassky again in a 1992 rematch played in the former Yugoslavia that defied U.S. sanctions and turned him into a fugitive from his native United States. He eventually became an Icelandic citizen after coming to the small North Atlantic island nation in 2005. The former child prodigy was in his later life known as much for his incendiary remarks and his battle with U.S. law enforcers as for his facility at the chessboard. Although he was Jewish, Fischer often made anti-Semitic remarks and said after the September 11 attacks he wanted to see his the United States wiped out. Spassky has offered few comments about his former rival in the wake of Fischer’s death, saying only the man was a friend. The Russian-born former champion, who now lives in Paris, was in Iceland with his wife for a chess event dedicated to Fischer’s memory. Speaking with reporters in Iceland on Sunday, Spassky said chess now was just not the same as in his day. 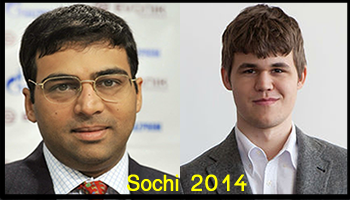 “As for the modern chess, I am pessimistic because in my view computers killed classic chess,” he said. 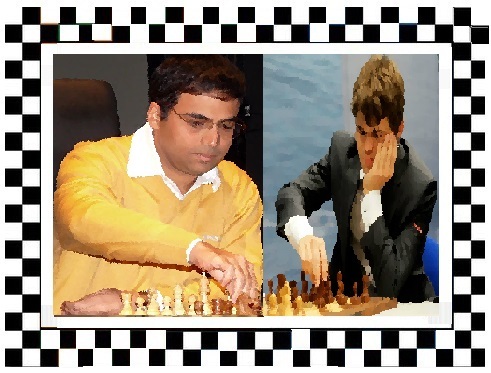 Read on THIS LINK on my blog about the musical “Chess”…in South Africa. 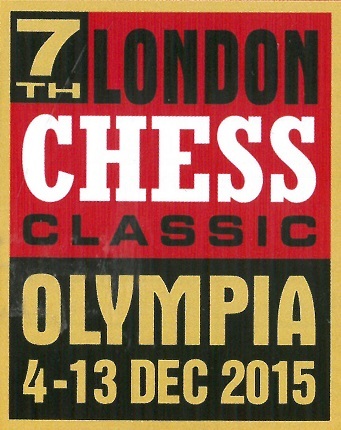 Tim Rice has been busy plotting all the right moves to bring his musical Chess back to London. The lyricist wrote Chess with Abba’s Bjorn Ulvaeus and Benny Andersson 25 years ago and it spawned a hit album, featuring Elaine Paige and Barbara Dickson, before it began its troubled stage history. 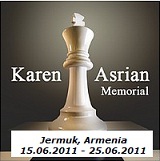 Two of the numbers from Chess – I Know Him So Well and One Night In Bangkok – became international hits. 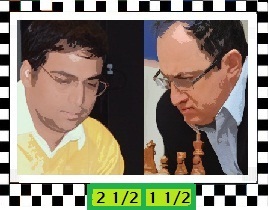 Now Rice is producing a concert version of Chess, to run at the Royal Albert Hall on May 12 and 13. The director Hugh Wooldridge has persuaded American lyrical baritone Josh Groban and award-winning Broadway star Idina Menzel – she was in the original London company of Wicked and is also in the movie Enchanted – to perform as the musical’s two lovers. The show explores a romantic triangle involving two chess champions – Russian and American – plus the American’s lover, set against a backdrop of KGB intrigue. Tim said one of the problems with the show’s earlier productions was that it was changed too much. Now, he intends to use the original album as a template for the concert in May. “Rather than set up a £20million production, we want to see how it holds up at the Albert Hall before we move ahead for an incredibly expensive production in a theatre,” the Oscar-winning songwriter told me. Any such West End show would be cast traditionally, and not on a TV talent show. He has just finished writing nine songs, set to music by Tchaikovsky, for an epic film called The Nutcracker: The Untold Story. Click HERE for the London Theatre-guide.